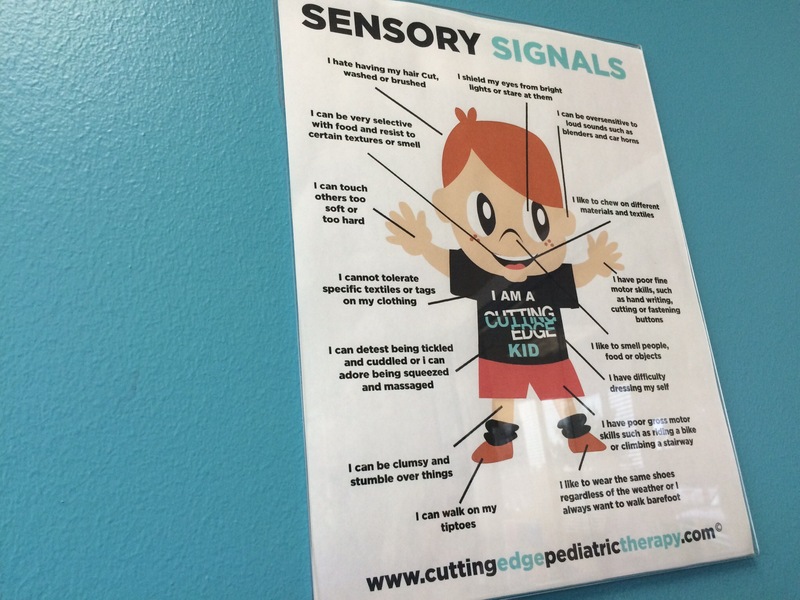 One thing we often hear from our families who come in for intake is that they’re frustrated—they’ve been to so many doctors, and their child has had so many tests, and in the end it all came down to sensory signals. They feel like they’ve been on a two-year mission to find an answer for something that turned out to be quite simple. Sensory signals are a specialized area of occupational therapy. Sensory problems can manifest themselves, and usually do manifest themselves, in problematic behaviors. It’s like anything else—if you’re uncomfortable in your own body, or not feeling well, that’s going to come out in behavior. That’s typically the way small children are, even as babies. Fussy babies are fussy for a reason. Fussy children and children who aren’t compliant, aren’t compliant for a reason. There’s usually a reason for everything, and that reason can be sensory. All children, as they develop, have times when their behavior is not good. That’s normal! However, our sensory kids have extraordinary problems with this all the time. And believe me, if sensory problems are an issue you know it, because you are managing your life and your schedule around your child. So whenever you feel like you are managing your schedule around your child more than your child being able to join in and adapt to your schedule, that’s usually a strong indication that there are some sensory issues. Check out the poster when you are in our waiting room—it’s a nice resource. We also have a checklist that we oftentimes give to our families. This checklist is broken down developmentally, so we have questions for infants/toddlers, for the preschool child, for the school-age child, and for the adults/adolescents. So these are just a few indicators for you to look at and consider, and we would be happy to talk to you about the whole checklist. Please go to our website because we have further information about that. And you’re welcome to come in or give us a call and chat about any concerns you might have. But sometimes it’s as simple as a little sensory therapy!